The RSPAM Series Automatic Rivet Setting & Eyeleting Machines are capable of auto feeding with very high production rate. They are electro-pneumatically operated, having short post or long post with auto feed and manual feed and Angular long post having auto feed and manual feed. The machines have a stroke of 50 mm (2″) for more loading room. Capacity to set rivets from 3 mm (0.12″) to 6 mm (0.24″) rivet shank dia and from 3 mm (0.12″) to 16 mm (0.63″) length. 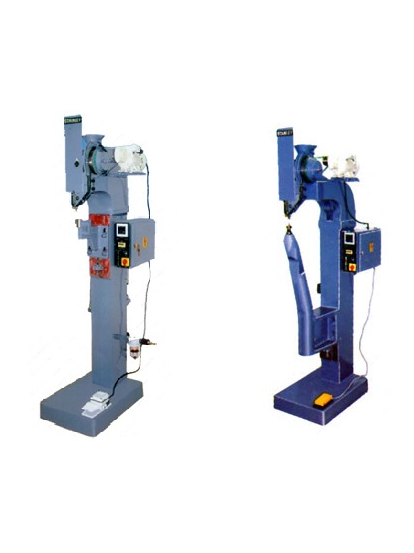 RSPA M-6 Short Post with 225mm(8.9”) standard throat depth, Manual Rivet Feed machine.